The author of the article is Alex Epstein, who has a BA in philosophy from Duke University, but no scientific background. 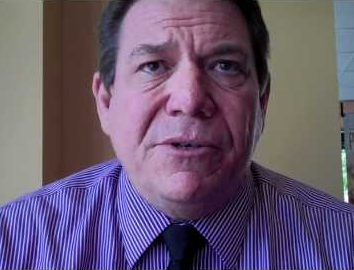 Epstein is a staunch, paid philosophical defender of the fossil fuel industry. His biggest claim to fame is a book he authored in 2014 called “The Moral Case for Fossil Fuels,” which seeks to make a philosophical case for fossil fuel use, evidently because a valid scientific case for continued fossil fuel use can’t be made. Epstein made Rolling Stone’s 2013 list of Global Warming’s Denier Elite, along with such well-known people and entities as Charles and David Koch, the American Legislative Exchange Council and Rex Tillerson, former CEO of Exxon who is now Secretary of State under Trump. 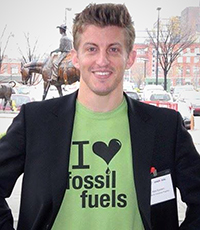 Alex Epstein, one of Rolling Stone’s 2013 Top Ten Climate Change Denier Elite. 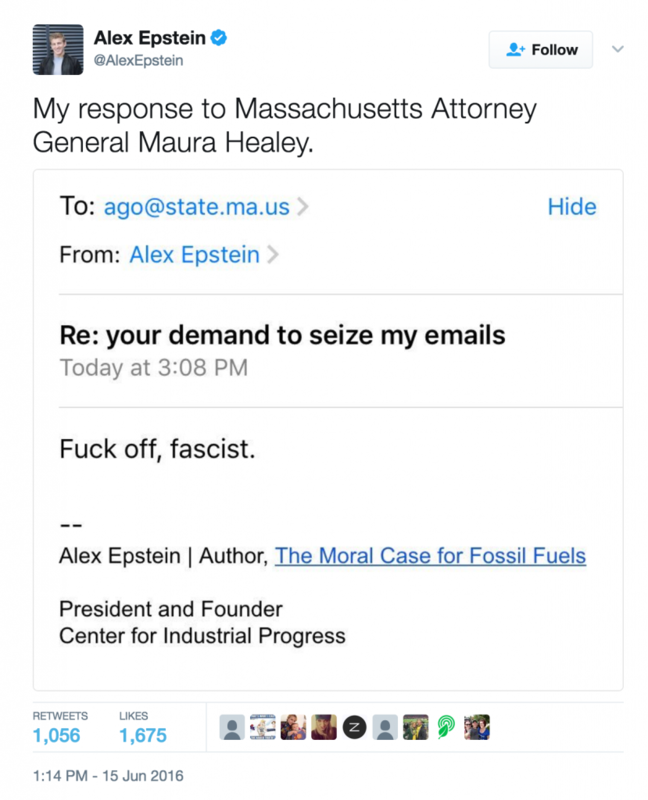 Epstein sent a nasty tweet to Massachusetts Attorney General Maura Healy after she subpoenaed his correspondence with ExxonMobil. Ray Scott cited an article by Epstein in Forbes magazine in an attempt to justify his continued climate change denial. Epstein’s organization, CIP, was one of the groups whose documents Healy subpoenaed in this investigation. This is all Ray Scott’s constituents to know about the kind of people he cites to help bolster his losing climate change denial arguments. What a nice proposal, by Ms Phillips, to silence one of the few, accurate, & sober voices of reason on climate, & fossil fuels. > Alex Epstein, who has a BA in philosophy from Duke University, but no scientific background. If Leftists were more than pseudo-educated, they would know that Aristotle discovered scientific method. Philosophy, not science is basic to knowledge. Science does not justify itself. Today’s science is partially guided by arbitrary hypotheses, observations, measurements, experiments and interpretations. It has become corrupted to rationalize Leftist-nihilist haters of man’s independent mind. When “scientists” claim that man’s independent mind is an illusion, science is vanishing back into the irrational cultural swamps before the West was created. Hey Anne, it ain’t Bourbon. It ain’t gonna get no better with age.. Oh Lord, I’m stuck in moderation again…. American Patriot is right on….”Retired Coal Miners Could Lose Health Insurance this Week” thanks to Peabody Energy. Wonder who she meant by “we”? Maybe Bernie was right? She is working for the nuclear energy industry. What I said was, I don’t dance. I never said I couldn’t. And oh yeah, there will be collateral damage; the coal miners of West Virginia. But then you knew that. Or did you expect the Peabody Coal Train to just haul them away? You gonna find your way to heaven is a rough and rocky road, if you don’t stop to smell the roses along the way. And a rose by any other name? We need to get rid of politicians like Ray Scott, that have NO vision and are afraid of change. I can only bet that he is heavily invested in fossil fuels. He has the longest job now that he has ever held. This has to change….or are we too afraid of change ourselves? Never mind Alex Epstein. If you read more of what he writes, it becomes abundantly clear that he is desperate to “convince” his side of the issue to keep that “donation” money flowing in his direction. He plays to fear and unwillingness to change. He reminds me of the Erie Canal mule barge drivers when the trains started moving. He represents the worst kind of “sage” of fossil fuel positioning. You have to give him credit for identifying and implementing a system for sucking money from the fossil fuel businesses and fearful investors. What is important is the fossil fuel company movements themselves. Saudi ARAMCO is selling off part of its company as an IPO in order to finance “alternative” energy development. This is unprecedented. We all know that Saudi Arabia has more than its share of fossil fuel and sun. Even when we were still with the company as active employees, the ideas of developing alternative energy was getting more support from the Royals and Upper management. Now the company is making that turn. Coal is NEVER coming back. Even the miners of West Virginia know that. There are NO LONG TERM MARKETS for the coal. We, as a public, never made a cent off coal. In fact, coal was and has been totally subsidized for decades. Our leaders, including Ray Scott, do not understand global economics in relation to coal or natural gas. Jordan Cove is another American taxpayer boondoggle. “IF” and I repeat…”IF” Jordan Cove were to be built, by the time the terminal was completed, with alternatives moving as rapidly as they have to take over energy needs (investments 2:1; Tesla the most valuable car company; battery development); Jordan Cove would never be used. Japan has already invested heavily in solar, wind and tide power to take the place of Nuclear after the Fukushima debacle, which is still poisoning our west coast. The economics, in a true “capitalistic” system, will not support long term fossil fuel use. Those that hang on like a tenacious bugger, are milking the last drops from the teats of a past and are just waiting for the final dry hole. Buy NEW technology.